Passengers’ locations slightly out of the way? No worries, you get extra bonus for that extra miles, and we continuously reward all our active drivers using GrabHitch. On top of the November Loyalty rewards, 5 LUCKY TOP DRIVERS will be invited to our office to be featured in our newsletter. Go forth and go the extra mile to save travel costs, know new friends and save the world! These are based on the total number of rides completed in a month AND number of driver active days. *Active day is a day where you complete at least 1 ride. We’ll reach out to you via email at the end of the month with more instructions on how to claim your well deserved rewards. Keep a look out for our emails! New to GrabHitch? Bookmark this Drivers Resource Page, your one-stop page for all the tips, tutorials and bonuses as a GrabHitch driver! This November driver loyalty program runs from 1 November – 30 November 2016. This November driver loyalty program is available only for GrabHitch Malaysia drivers for rides within Klang Valley only. Only completed rides on GrabHitch will count towards the overall tally for the month. The rewards must be claimed by eligible participants at the end of the loyalty program. Unclaimed rewards will not be given out. Instructions to claim the rewards will be published through email at the end of the loyalty program. Each repeated passenger can only contribute a maximum of 5 rides towards the November program for Rides. For example, if you picked up Passenger A for 8 times, only 5 rides are counted and you need another 5 more rides from different passengers to qualify for Tier 2. This limit does not apply to Days Tier rewards. The cash prize will be reflected in your driver wallet at the of the month within 10 working days after we have contacted you to claim your reward. Cash rewards for the individual tiers are NON-compoundable, but rewards across 2 separate tiers are compoundable. 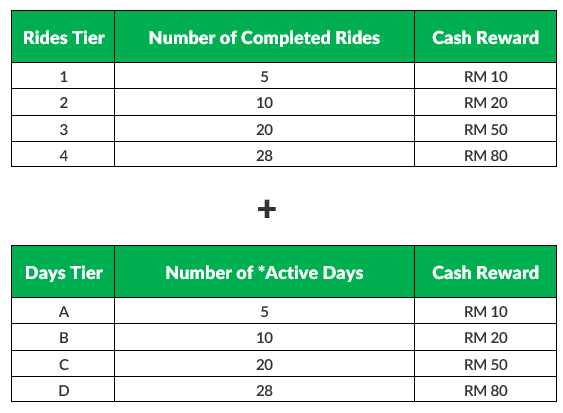 For example, if you complete 20 rides in 10 days, RM50 plus another RM20 from Days Tier will be rewarded. Any violation of GrabHitch guidelines i.e. High cancellations by drivers, late pick ups, overcharging passengers, requesting that passengers pay tolls, any form of gaming the system will immediately disqualify drivers from receiving any rewards. All decisions by GrabHitch are final, including the details of this November driver loyalty program and no correspondence will be entertained. We also reserve the right to ensure drivers and passengers are genuine in using this loyalty program, and any suspected fraudulent activities will be caught and taken action against according to GrabHitch’s usual SOP.